iSelect is gold as far as newspaper pack-ins go. Oh, good Lord. Another David Bowie collection? How many does he have now? 20? Well, maybe 20 is an exaggeration if we limit ourselves to officially-licensed CD collections, but the number's not far off. Most are devoted to the hits of a given era, some are devoted to rare tracks, a few don't really seem to court any greater purpose whatsoever. Cumulatively, they represent repeated attempts to shoehorn Bowie the artist into a box that he never really seems to fit in. To call Bowie a chameleon is cliché at this point, but it's as apt as anything; Bowie plays the part that suits him at any given time. To date, to try and summarize his work is to miss at least a little bit of the big picture. So perhaps we don't need another Bowie compilation, but we're going to get one anyway, courtesy of British paper The Mail on Sunday, on the surface another modern example of a print publication courting an increasingly online populace through free gifts and gimmicks that have little to do with the paper itself. 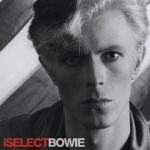 The difference, however, is that iSelect is actually something special, in that Bowie picked the tracklist himself. Even more than that, the tracklist actually looks like something he'd have picked himself, rather than having a manager or publicist pick it for him (after which he'd, of course, sign off on it for the sake of authenticity). There is but a single immediately recognizable Big Hit Song, a full three songs court seven-minute playing times (a stat peaking at Diamond Dogs' stunning "Sweet Thing"/"Candidate"/"Sweet Thing (Reprise)" triptych), and many of the songs are unique examples of Bowie sounding utterly unlike the caricature we've come to associate with his name. The idea and the execution were so well-received, in fact, that iSelect is now getting a wide release courtesy of Astralwerks. He eases us in to the collection with "Life on Mars", which is such a big hit that it has its own TV show at this point, but despite the fact that it has a sort of familiarity that the other tracks on iSelect could only aspire to, it fits right in with its orchestral, almost operatic flair. "Life on Mars" is a highlight no matter what compilation it ends up on, and that's not changed here. Other more surprising but just as valuable contributions include "Lady Grinning Soul", the classic Mike Garson spotlight and Aladdin Sane closer that somehow manages to skirt the line between classical, prog, and exotica, and "Teenage Wildlife", the Scary Monsters chugger that feels like it lasts about half of its seven-minute run time. There are even two tracks that, for now, are exclusive to iSelect. The first to appear is "Some Are" -- which has, to date, only shown up as a bonus track on the Rykodisc edition of Low -- and is a beautiful, percussionless piece that somehow predates the quiet synth experiements of bands like Coil and Current 93 by almost ten years. Later on, we get a new remix of "Time Will Crawl", which mercifully ditches the drum machine and beefs up the arrangement, allowing for the sort of weight that the original aspired to but never achieved. These two tracks alone may well be worth the album's price for the Bowie collector. Still, someone looking to go into iSelect for the sake of getting a sense of the appeal of Bowie's music may actually still be better off looking into one of the aforementioned hits collections. These are by no means Bowie's most memorable melodies, and some of them can be particularly off-putting. "The Bewlay Brothers", though it may contain some of Bowie's most poetic and obliquely self-referential lyrics, lopes along at a pace just a bit too slow to ever be catchy, and Young Americans' "Win" has a big pre-chorus that actually comes off as just plain awkward in its non-rhyming, oddly rhythmic way. As it is, the ideal audience for iSelect is one that is coming at the compilation from the position of curiosity. The liner notes are, frankly, pretty incredible (not to mention reprinted at The Mail's website), a rare look at the creation of some of Bowie's best deep cuts. The exclusive tracks are actually worth hearing, far stronger than the typical slate of outtakes and alternate versions that usually get tacked on to these things. More than anything, you're getting a look into Bowie's mind -- the mere fact that Bowie holds these tracks in high regard may just be enough to cause you to hear them in a way you've never heard them before. iSelect really is so much more than a tossed-off newspaper pack-in; it's a unique take on a Bowie comp that might be just enough to tide you over for the next year or two in this long wait for another proper album.